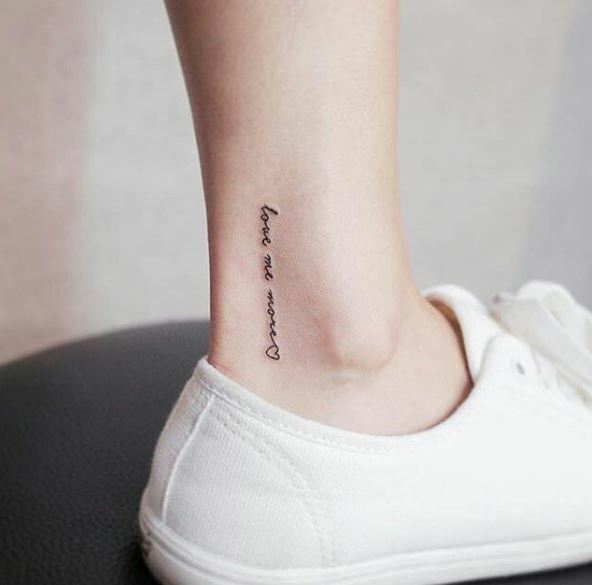 For those who wish to get a small tattoo, the ankle is the perfect place to start. 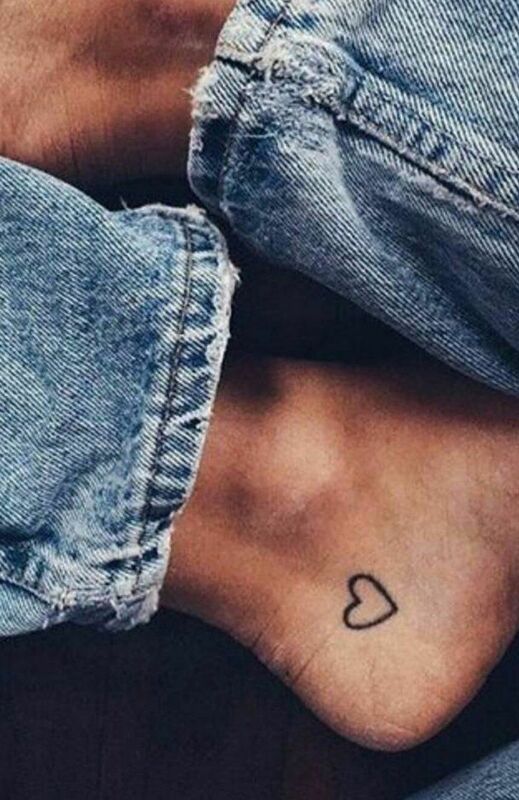 Ankle tattoos can not only be dainty and sweet, but personal and private too. 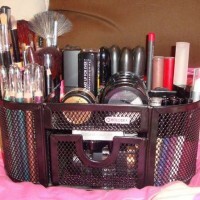 They are easy to hide away and keep for yourself, but just as easy to show off if you should want to. 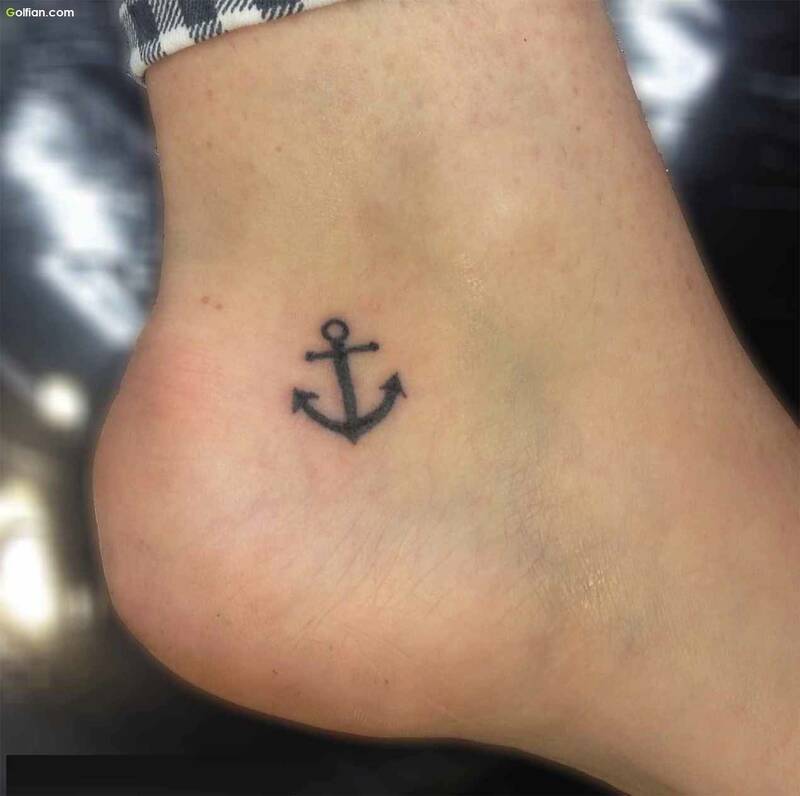 No matter what your reason for choosing to have a tattoo – we think the ankle is the perfect place to start. 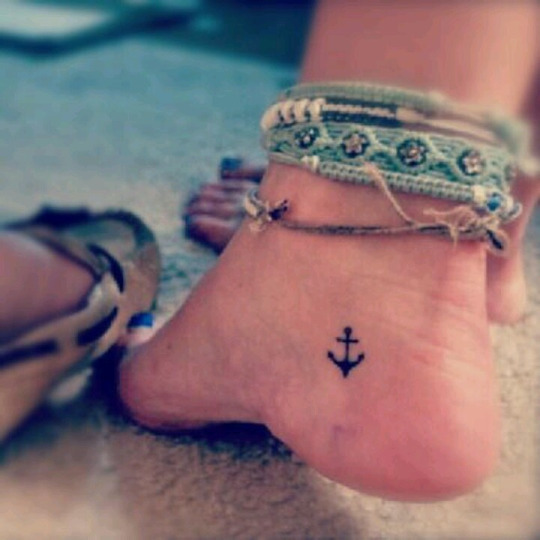 Especially because there are a stunning range of tattoo designs which look incredible on the ankle too! 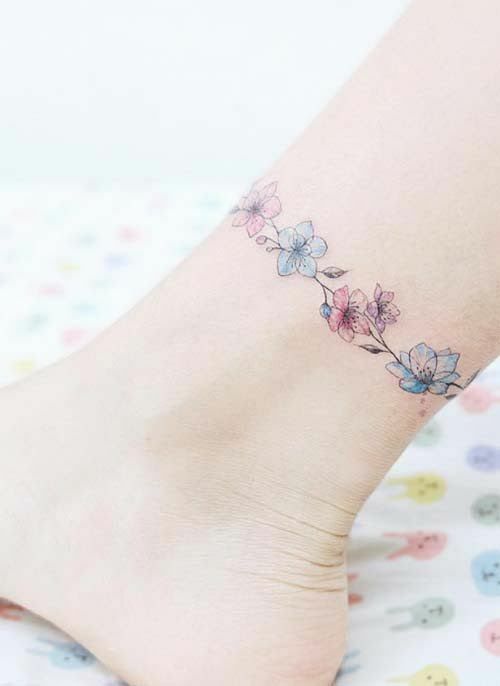 Here are 10 ideas for ankle tattoos which we think you will just love. 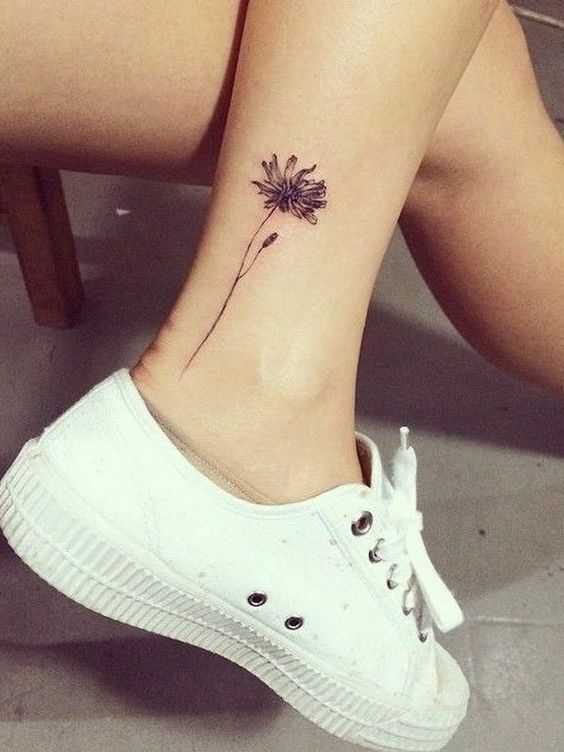 Dandelions are absolutely gorgeous, and opting for a dandelion tattoo on your ankle will be just perfect. Not only is it beautiful to look at, but incredibly symbolic too. Blowing a dandelion has a famous tradition, requiring you to make a wish. 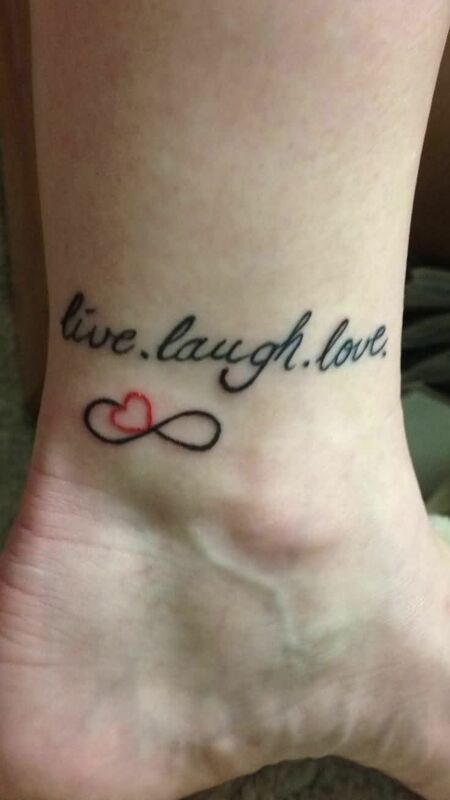 This is a lovely concept to have on your ankle. This lengthy tattoo looks absolutely beautiful in this location. Symbolising freedom, growth, flying the nest or even a desire to travel, little birds are a staple tattoo design. 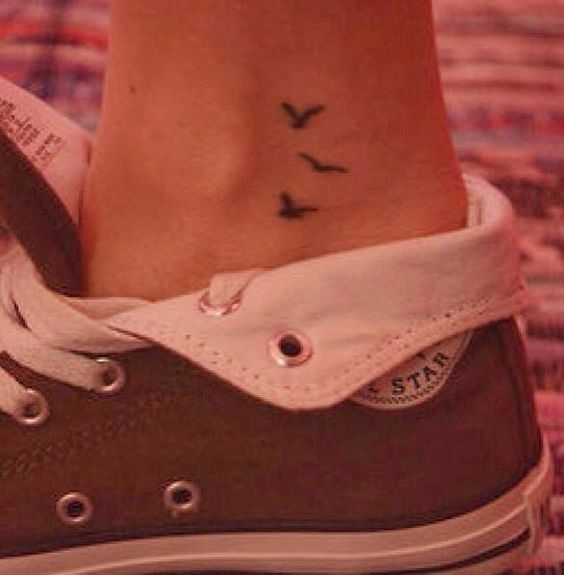 These adorable little birds make the perfect ankle tattoo. They’re so small – it’s almost beyond easy to miss them! 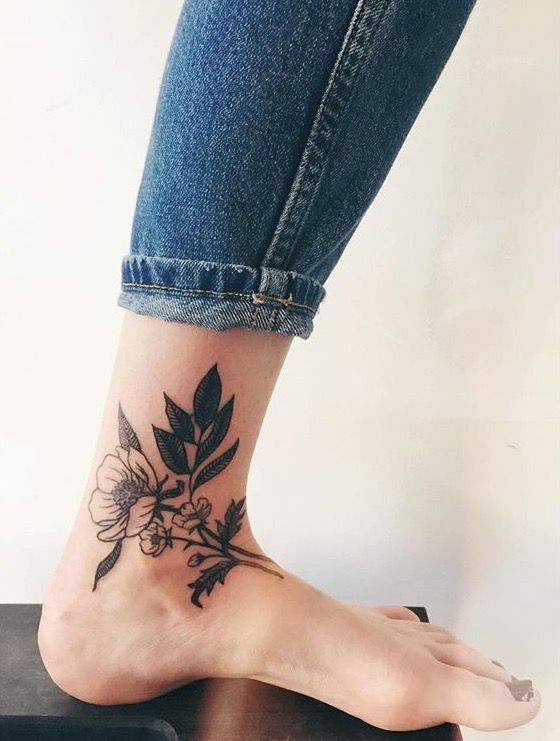 The placement of the three birds looks incredibly sweet on the ankle, offering a subtle and symbolic inking perfect for a first time tattoo. 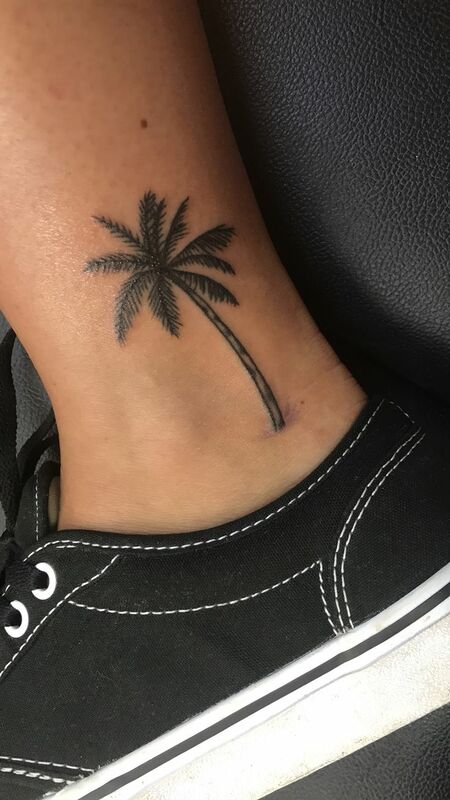 This might just be one of our favourite ankle tattoos from this entire collection! 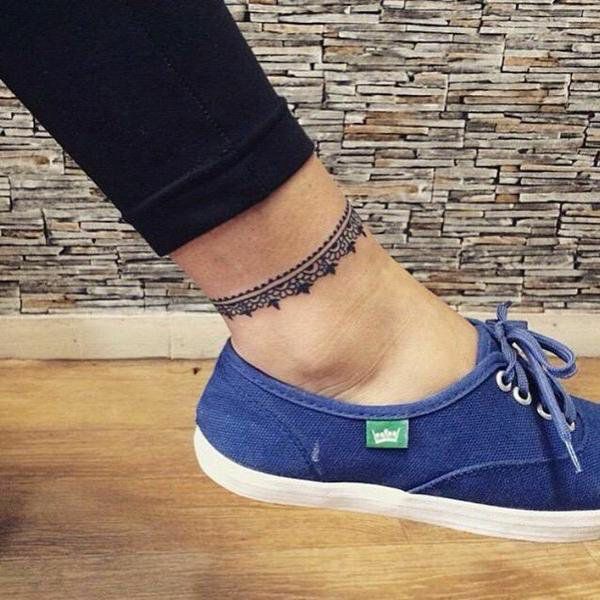 This stunning anklet design is to die for. 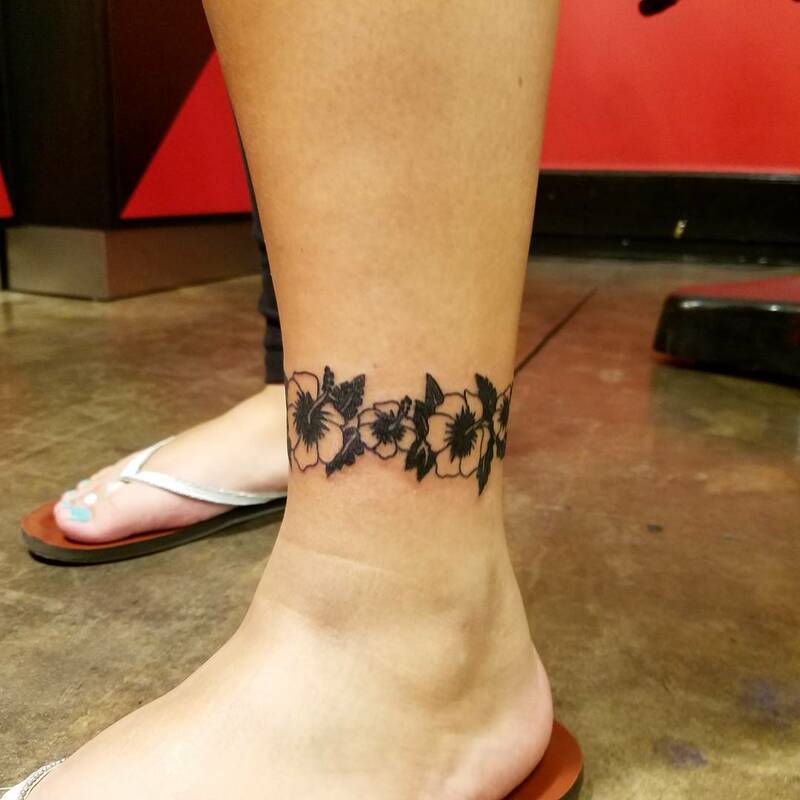 Wrapping right around the ankle, these beautiful flowers join to create the appearance of an anklet. The flowers are absolutely gorgeous, adding a welcome pop of colour to the design. Choose your favourite flowers and colours to personalise this tattoo to your tastes! 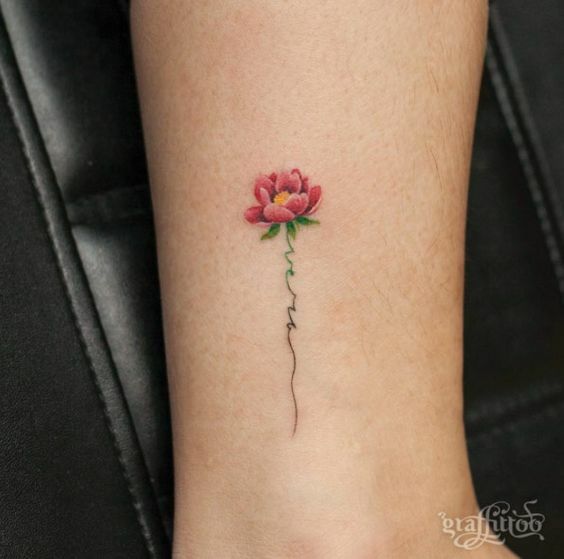 Lotus flowers are incredibly popular when it comes to tattoo design, and after one look at this beautiful tattoo it’s not difficult to see why. Symbolising purity and harmony, these flowers are not only gorgeous to look at, but lovely in meaning too. 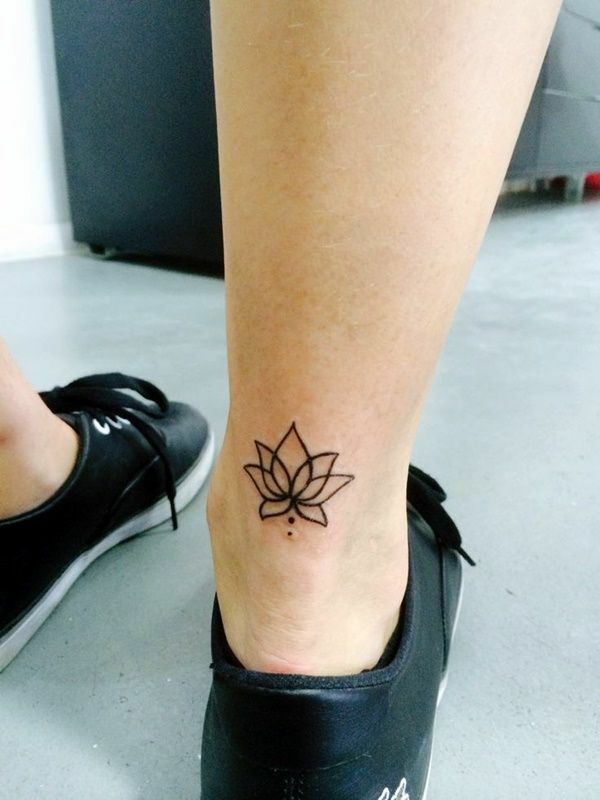 This pretty pink lotus design looks incredible on the ankle, and we love the root growing downwards too! 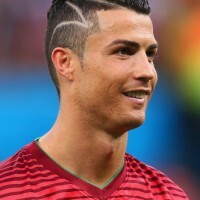 Tribal-style tattoos have long since been a favourite in the tattoo world. With hidden meanings and stunning aesthetics, they come in all shapes and sizes. They are also much loved by the tattoo community. 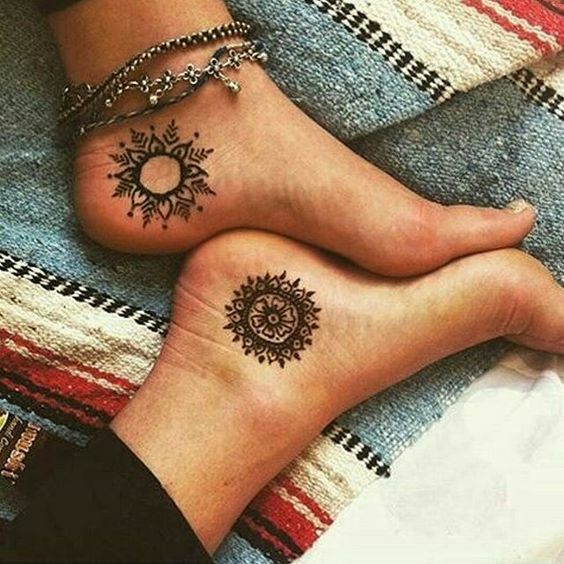 We love how these ankle tattoos are a pair which compliment each other, but each has its subtle differences and unique elements. Roses are famously beautiful flowers, and unsurprisingly they make beautiful tattoos too! 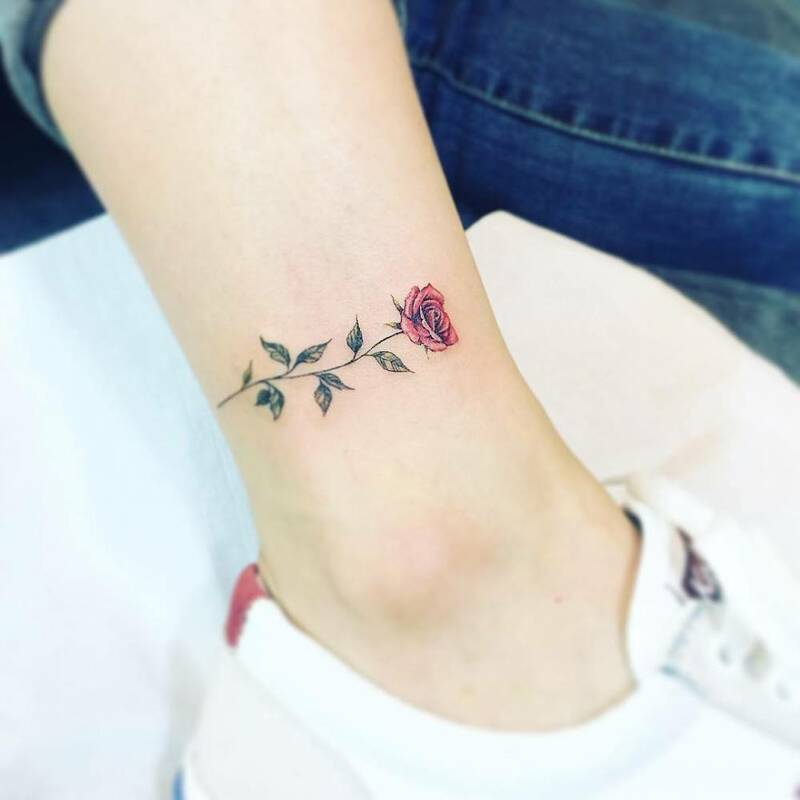 We adore this rose ankle tattoo. 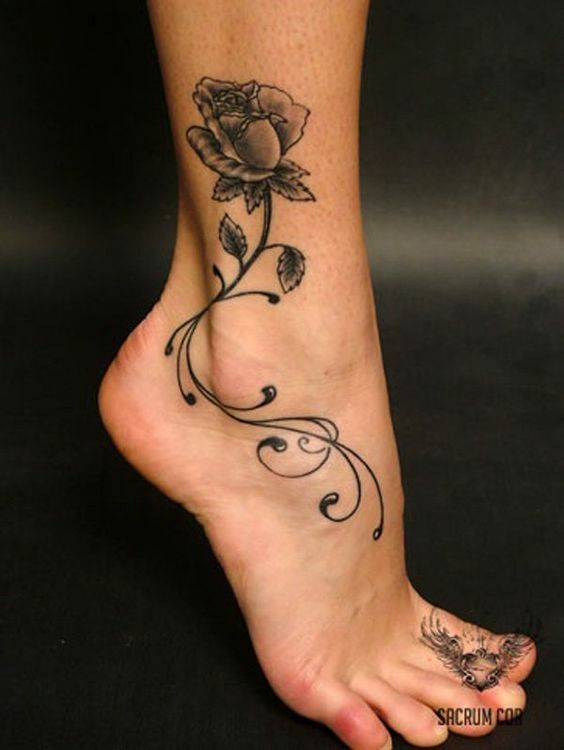 Starting with a gorgeous rose design high on the ankle, the flower swirls down towards the foot. 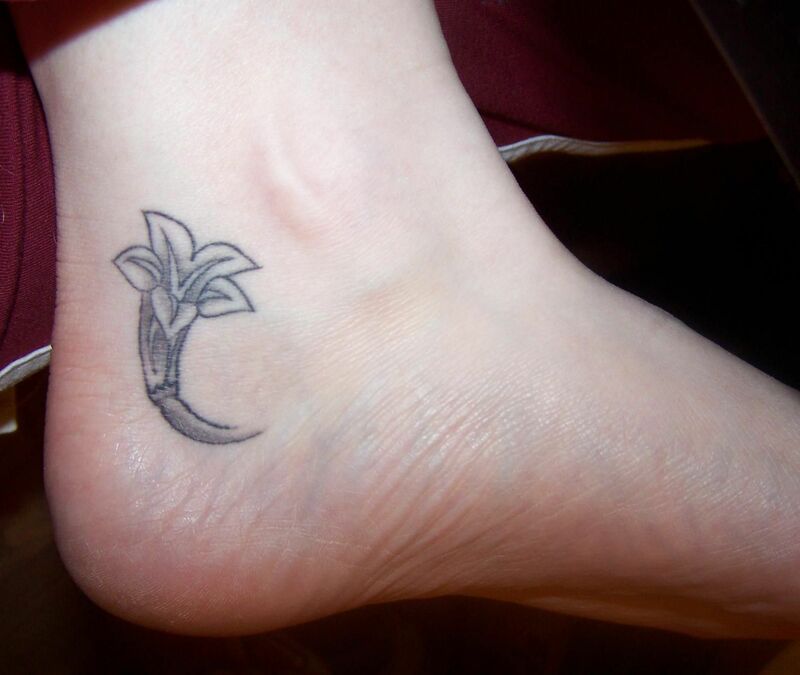 This creates a pretty, swirling root effect which looks utterly gorgeous located on the ankle. You can choose your favourite flower for a similar design! 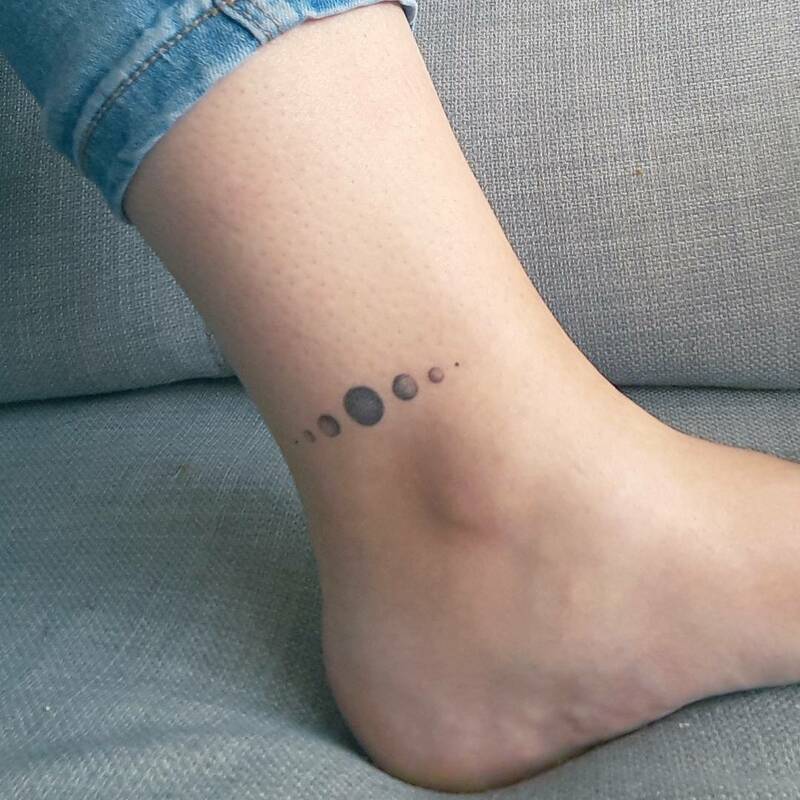 Outer space is a pretty cool subject – and we think it makes a pretty cool tattoo design too! 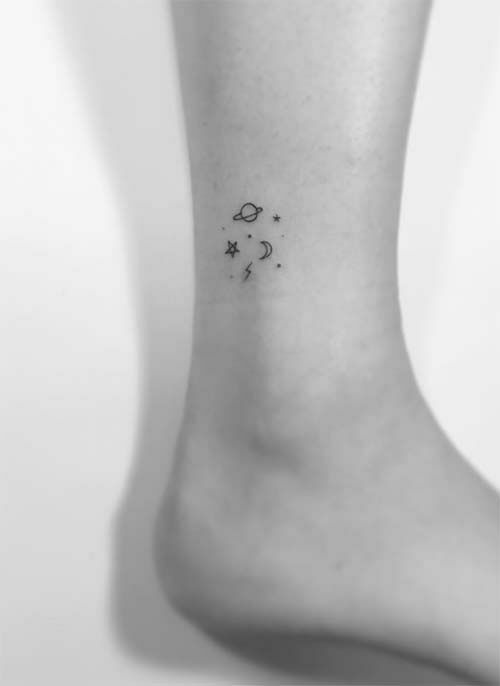 This adorable miniature tattoo design comprises of several different elements of space in the cutest ankle tattoo we ever did see. 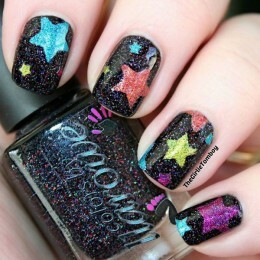 With incredibly dainty tattoo work, this look is created with a planet, a star, the moon, a lightening bolt and tiny little dots for a fancy finish. 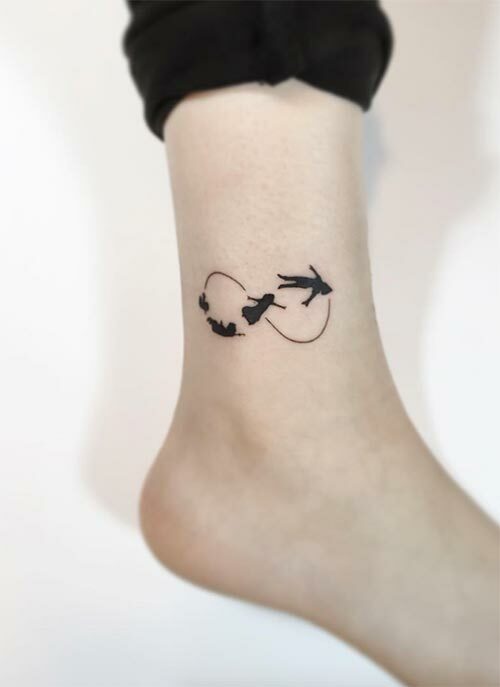 In another cool anklet style tattoo, this cool tribal effect arrow wraps right around the ankle. 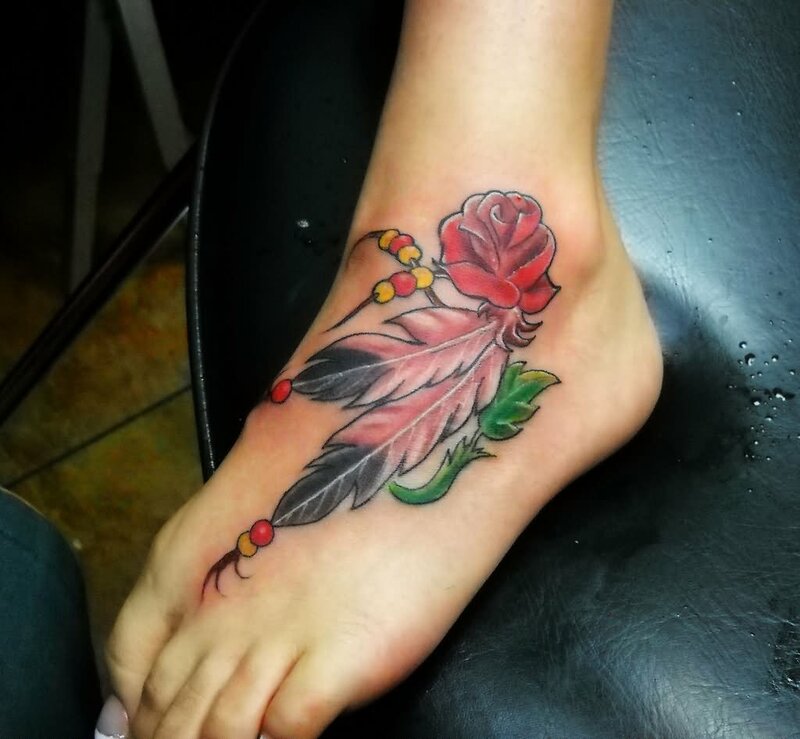 With a thick and fully painted black arrow at the tip, it wraps right around the ankle and finishes with a gorgeous feathered end to the arrow head in a cool contrast. 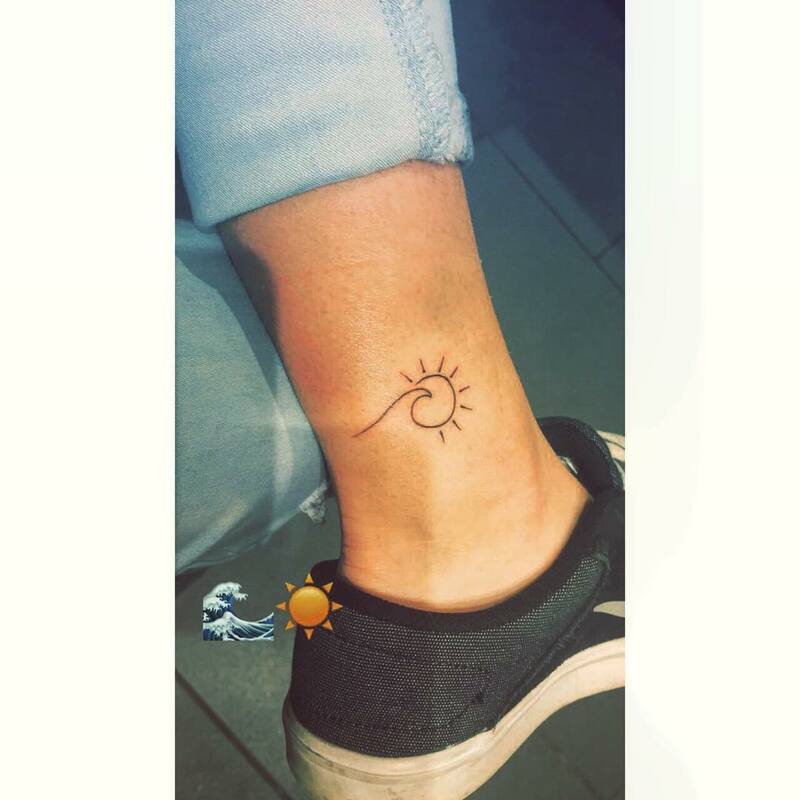 This fancy anklet style tattoo is just perfect around the ankle – don’t you think? 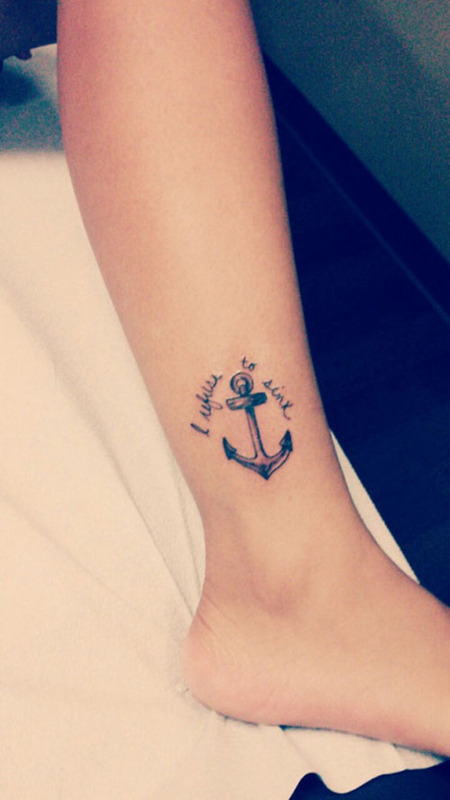 Chandelier tattoos are incredibly popular for the ankle – one look at this picture should tell you exactly why. 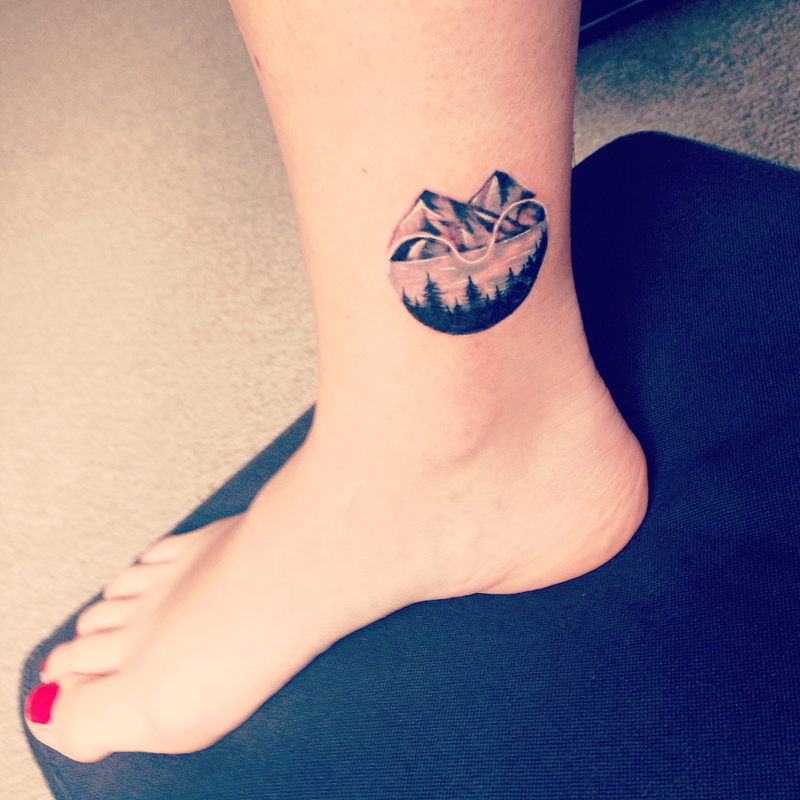 This absolutely stunning tattoo has stolen the hearts of the Styles Weekly office! Wrapping right around the ankle, this chandelier falls right down from the front of the ankle and across the foot. The tattoo is oh so intricate and beautiful. 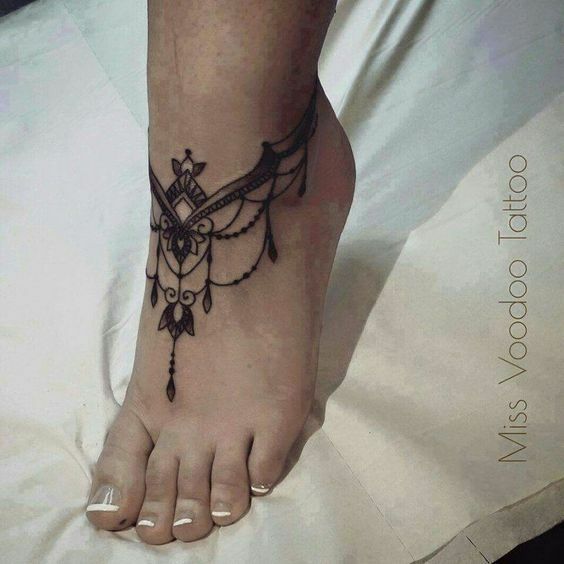 Slightly more dainty than the previous chandelier tattoo, this one has more intricate inking right around the ankle. 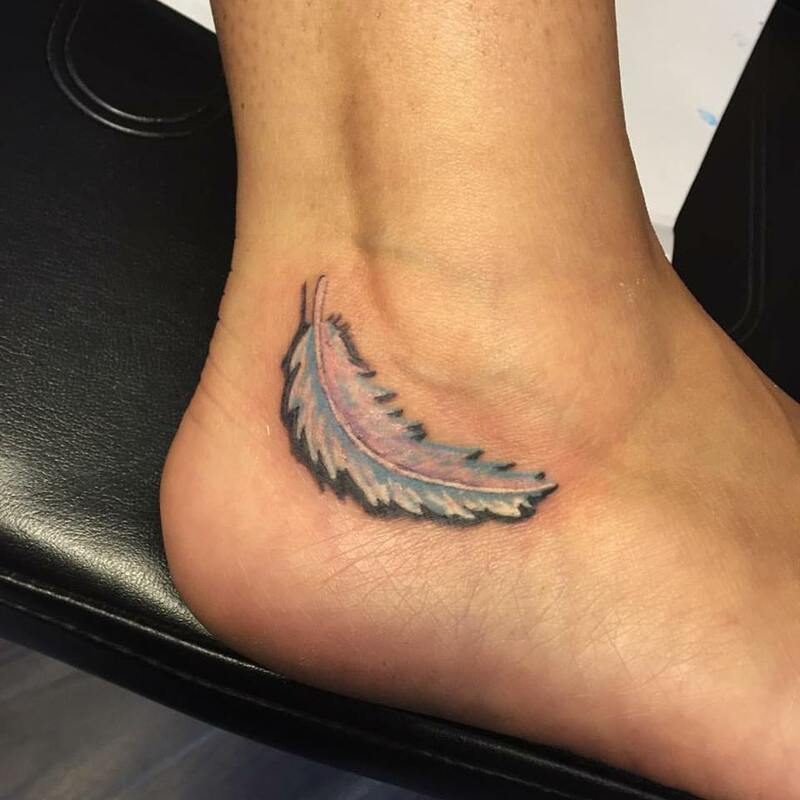 Equally beautiful, with a stunning attention to detail, this chandelier ankle tattoo also features a feather too. The feather is a stunning piece of art, and falls down the foot for the most incredible finished result. 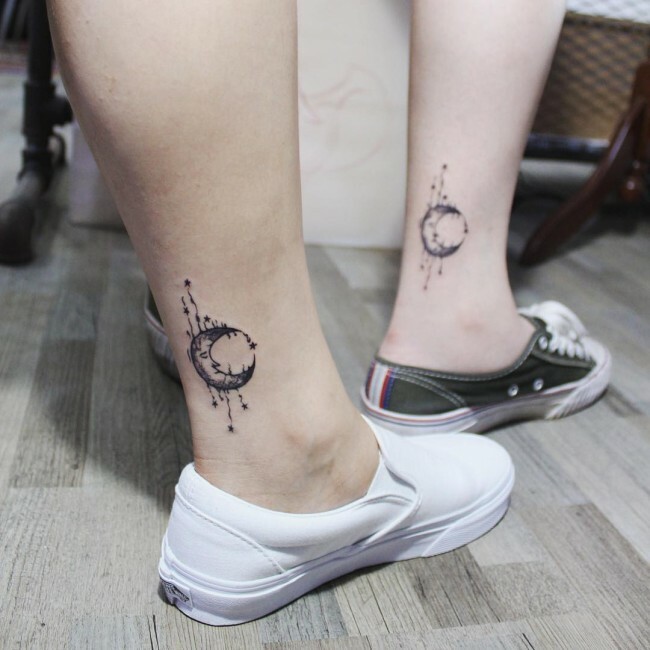 Which of these ankle tattoos do you like the most? 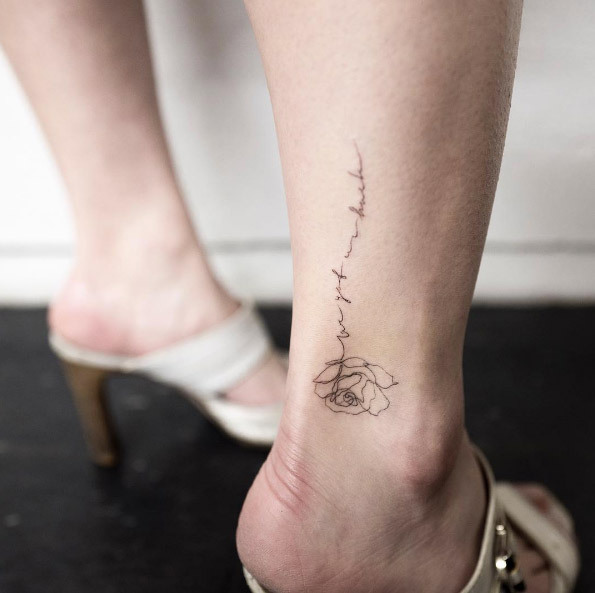 Have Styles Weekly inspired you to choose your first ankle tattoo? Let us know which types of tattoos you’d like us to explore next. 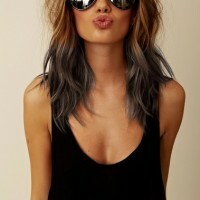 We will attempt to gather the perfect gallery of tattoo inspiration together for you.